The Project Guts training prepares science teachers to incorporate computer science, specifically modelling and simulation, into their science classes. The Middle School Elective program prepares teachers to teach a middle school elective in computer science. The Middle School Coaches Academy prepares school staff to conduct local professional development sessions in implementing the new integrated computer science SOLS. CodeVA provides training tuition waivers to all full-time educators working in Virginia public school divisions who are accepted through our registration process. This includes all curricular materials. Need more information about the new Virginia Computer Science SOLs? Check out our webinar: Decoding the Computer Science SOLs. 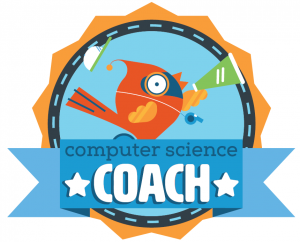 This training awards school staff a certificate as a CodeVA Middle School Computer Science Coach, allowing you to build your district capacity to train your teachers on the new standards. The VDOE has finalized the new Computer Science SOLs. These standards are defined for each grade K – 8 and are intended to be integrated into core classes. The program includes online modules covering core content, a week-long in-person practicum, and follow up sessions during the school year. The Middle School Computer Science SOLs place particular emphasis on modeling and simulation in the sciences. In 6th grade students are asked to use models and simulations, in 7th modify existing ones and by 8th grade they should be coding models in order to conduct simulations. Project GUTS — Growing Up Thinking Scientifically — is a science, technology, engineering and math (STEM) program for middle school students serving schools and districts nationally. Growing up thinking scientifically means learning to look at the world and ask questions, develop answers to the questions through scientific inquiry, and design solutions to their problems. This programs covers the new Computer Science SOLS and provides instruction on Star Nova, a program specifically designed for creating models and running simulations. Our trainers are current teachers and have experience in integrating computer science into the middle school classroom. The initial training takes three days over the summer, and two follow up Saturday sessions during the school year. While CodeVA cannot cover travel costs all materials are free of charge to public school teachers. The VDOE has finalized the new Computer Science SOLs. These standards are defined for each grade K – 8 and are intended to be integrated into core classes. The project Guts program trains teachers to integrate CS into their middle school science classes. The Middle School Computer Science Standards define a new elective designed to work in all Virginia middle schools. The course is flexible and can be implemented as a 6 or 9 week rotation, or as a 12, 18 or 36 week course. The CS Discoveries training prepares teachers to implement this elective. Computer Science encompasses far more than just coding. CS Discoveries will provide students with opportunities to explore the many facets of computer science, both in terms of how they are personally relevant as well as how they impact society. The course takes a wide lens on computer science by covering topics such as programming, physical computing, HTML/CSS, and data. The course inspires students as they build their own websites, apps, games, and physical computing devices. The initial training takes five days over the summer, and four follow up Saturday sessions during the school year. While CodeVA cannot cover travel costs all materials are free of charge to public school teachers.